The puzzles that appear at KenKen.com and within the KenKen app are automatically generated by something that those folks call the KENerator. (Clever, no?) 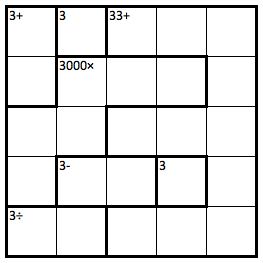 Likewise, the puzzles that appear in the MathDoku Pro app are also generated by a computer algorithm. The benefit is that both of these sources will provide a nearly infinite supply of puzzles. The downside is that computers don’t think as well as humans, so the puzzles range from mundane to amusing, and, in the words of Thomas Snyder, are “too easy and too computer-generated.” Rarely do they fall into the category of truly interesting. That’s why Thomas Snyder attempted to outdo The New York Times KenKen puzzle back in 2009, when he presented a new KenKen puzzle every day. His themed puzzles were meant so show “what the puzzle should be” and how to make them interesting. Of the 20+ puzzles he presented, this is my favorite, which he created for March 3 (3/3). You can see the large numeral “3” formed by the cage along the right edge of the puzzle. Further, every cage includes at least one digit 3 as part of the target number. 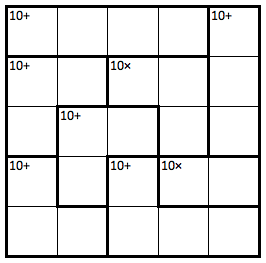 I also like his “Perfect Ten” puzzle, where every cage has 10 as the target number. Like Snyder, I agree that KenKen puzzles are generally more interesting — and, usually, more difficult — when they’re created by a human instead of a computer. The following are several themed puzzles that I’ve created. 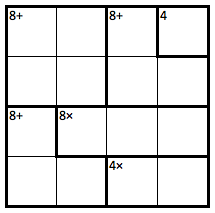 This puzzle is relatively easy, but I like that it uses only 8’s and 4’s. In honor of the small town of Eighty-Four, PA — which apocryphally is said to be named after the town’s mile marker on the Baltimore & Ohio Railroad — I call this the “B&O” puzzle. You may know that 1! = 1, 2! = 2, 3! = 6, …, 6! = 720, and that these numbers are known as factorials. Consequently, I call this the “Factorial” puzzle, since the target numbers are the first six factorials. Of all the puzzles that I’ve created, my all-time favorite is a special 8 × 8 puzzle that I created in honor of the current year. But if you want to see it, you’ll need to check back on Sunday, September 25, for AWOKK, Day 7. Last Wednesday evening, Steven Strogatz delivered the opening session at the 2014 NCTM Annual Meeting in New Orleans. I was ecstatic to see humor at the top of his list. As an example of humorous mathematics, he played the now infamous Verizon .002 phone call. As it turns out, the week was full of humor. 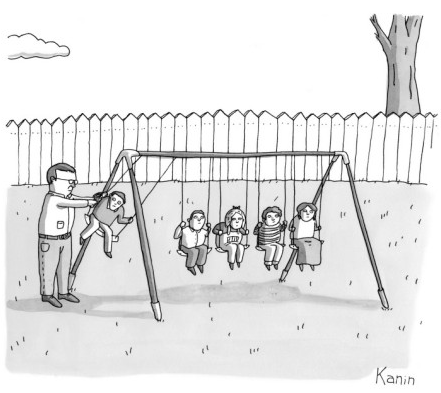 (Who’da thunk, at a math conference?) Bill Amend, author of the comic strip Foxtrot, delivered the closing session at the conference. Earlier the same day, yours truly gave my soon-to-be-famous Punz and Puzzles talk to a standing-room-only crowd. But who cares? If her son is laughing, I’m smiling! Though funny may not be the right word. Perhaps interesting is a better choice, because Pythagorean serum was the name we used for the concoction that was served at my book release party. Costume weapons must be inspected and peace bonded. Taking costume weapons outside the hotel will create conflict. The conference was Balticon 46, the annual convention of the Baltimore Science Fiction Society. Attendees included science fiction writers, engineers, physicists, and other scientists. To my great surprise, I was envious. No, I did not have any interest in dressing like Mr. Spock, a troll, or Supergirl. But just as Susan Orlean observed true passion through the eyes of John Laroche while writing The Orchid Thief, I felt the fervor of the Balticon attendees. They are deeply passionate about science, they embrace their inner geek, and they devote themselves to learning so they can write science fiction that feels real. I found myself hoping to someday be as passionate about something — anything — as these folks. That sign alone made my attendance worthwhile. It would appear that the conference is attended by lascivious, orally fixated, math-loving Jews. That’s an interesting demographic. At the end of my presentation, I asked if anyone had a math joke to share. One gentleman stood up eagerly and said, “Yes, I have some.” Uh-oh. Here’s a guy who wants to occupy the stage for a while. His first joke (below) was reasonable. His next five were not… but I’ll spare you the pain. Today’s post contains several puzzles, the answer to each is a short word, and at least one of the answers is a very old word, indeed. Teacher: Use the word announce in a sentence. Student: Yes, ma’am. Announce is one-sixteenth of a pound. 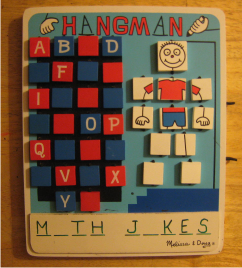 The first puzzle is about the game Hangman. In the game of Hangman, the first player thinks of a word and reveals the number of letters. The second player then guesses letters. If a guessed letter is in the word, the first player reveals the position(s) of every occurrence of that letter within the word. If the guessed letter is not in the word, then the second player receives a body part for a man who is hanging from a gallows (hence the name, Hangman). If the entire man is completed before the word is guessed, the second player has been hanged and loses. What is the best word to use when playing Hangman? And does the best word change, depending on how many body parts are in the version you play? Surprisingly, McLoone found that there is a single best Hangman word, for any game with 8 to 13 body parts. A strong hint is included at the bottom of this post. Find an “acre” word, which is a word with a product value of 43,560, the number of square feet in an acre. The (unique) answer happens to be one of my favorite English words. Find a four-letter English word with the largest possible product value. According to Scrabble Australia, there are 16,739 four-letter words. However, many of those would not be considered common — such as euoi (an impassioned cry), nabk (berries you’ve never tasted, from a plant you’ve never seen), and zizz (a short sleep). The last of these examples has an impressive product value of 263 = 17,576, but it’s not the highest. 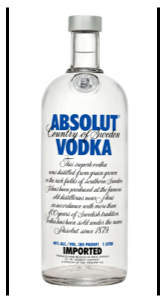 Not even close, in fact; its product value is only 7.8% of the largest product value for a four-letter word. 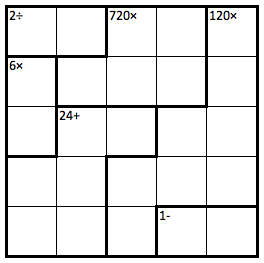 You can explore similar puzzles with the Product Value Calculators on the MJ4MF website. The best Hangman word (according to McLoone’s analysis) has a product value of 6,760. The defintion of the acre word is “alternating layers of silt or clay, usually of contrasting colors, that comprise an annual cycle of deposition in a body of still water.” That doesn’t help? Then just enter 43,560 into the second form on the Product Value Calculators page. And the four-letter word with the largest possible product value? It’s an anagram of the mythological river that divides Earth and the Underworld, as well as an anagram of the 70’s rock band that sang Come Sail Away and Mr. Roboto. 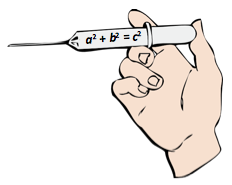 Finally, Beth Dare offered a cannibal joke that doesn’t fit the format… but since it makes fun of several math professions, it’s worth sharing, too. Five cannibals are hired as engineers at a defense company. The boss welcomes them, tells them they have complete access to the cafeteria, but asks them not to bother the other employees. Four weeks later, the boss congratulates them for their hard work, but he also says that the janitor is missing. “Do any of you know what happened to him?” the boss asks. None of them says anything, and the boss leaves. I’ll be presenting (an abridged version of) my workshop Puns and Puzzles at Reiter’s Books in Washington, DC, on Saturday, September 11. The presentation will combine jokes from Math Jokes 4 Mathy Folks, some new jokes and even a comedy sketch, as well as some of my favorite mathematical puzzles. If you happen to find yourself in the nation’s capital with nothing better to do on a Saturday afternoon, please stop by to say hello. Math Jokes 4 Mathy Folks will be available for sale, and after the presentation, I’ll be happy to sign a copy for you — or for the special geek in your life! I pick on blondes in the joke below, mainly because my wife is blonde. But my golden rule of joke telling is to personalize the joke for your audience — so feel free to replace blondes with graduate students, liberal arts majors, math professors, or whatever other group you happen to be speaking to. Two blondes walk into a bar and order two shots. They clink the glasses, yell, “Four weeks!” give each other a high five, and throw back the shots. They order two more. The bartender obliges. Again, they yell, “Four weeks!” and throw back the shots. They order another two. The bartender says he’ll be happy to pour them another round, but first he’d like to know what they’re celebrating. “We finished a jigsaw puzzle in four weeks!” explains one of them. The bartender is confused. “And…?” he asks.